There are over 4 million different plants and trees in the park which come from every continent aside from Antarctica! The park is also home to nearly 2,000 animals which represent approximately 300 species. This includes endangered species such as lowland gorillas and Sumatran tigers. Animal Kingdom is the only park that was not designed to have the park’s icon (the Tree of Life) visible from the entrance. Guests first walk through a section of plants and wildlife before crossing a bridge and being introduced to the wonder that is the Tree of Life. This is also the only park that has a form of nature as its icon as opposed to some sort of building. Have you ever wondered how the animals are kept from roaming around the grounds of Kilimanjaro Safari, or the whole park for that matter? There are actually several invisible barriers that are keeping the animals in without making it obvious to park guests. Things like moats and camouflaged fences are used to make sure the animals stay where they should while giving the illusion that they are roaming freely. There were once plans to make a section of the park that would be known as Beastly Kingdom, which would have been devoted to mythological creatures such as unicorns and dragons. Sadly, at the time, the ideas for this section of the park were too grand and the Beastly Kingdom never came to fruition. Animal Kingdom is actually Disney’s largest park, expanding about 540 acres. That’s big enough to fit nearly two Epcots or five Magic Kingdoms! LIKE US ON SOCIAL MEDIA TO GET UPDATES ON OUR BLOG AS SOON AS THEY COME OUT! Want a Disney wedding but don't quite have the budget? Here are some ways to incorporate a little Disney magic into your big day! During our ceremony I wore heels, but I knew long before the wedding day that I would not want those heels on all day long! 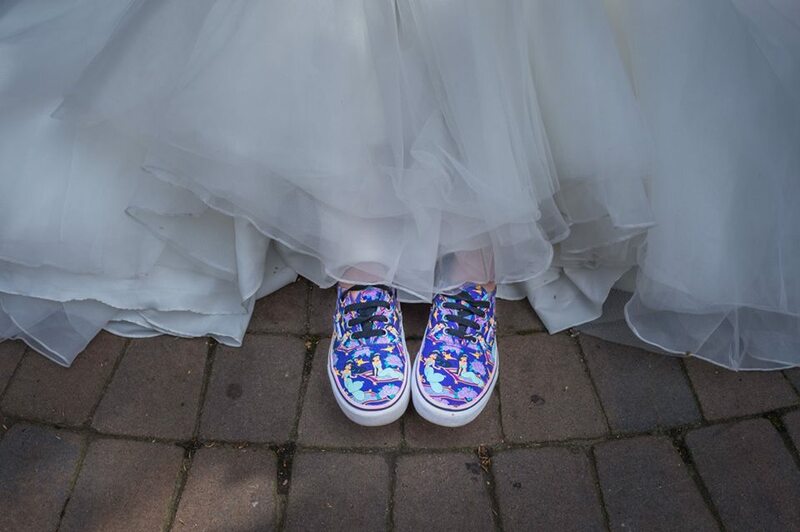 So for my reception I slipped into my Jasmine Vans, which were a big hit with our guests (and my feet)! I wanted to have some sort of Disney-themed centerpieces without them being over the top, so I chose 12 Disney love quotes (one for each table) and had them framed. Our favors were Mickey-shaped white chocolate lollipops (which were made for us by a family memeber) and doubled as the guest’s table cards! We used a Lenox Collection Mickey and Minnie figurine to decorate our sweetheart table. Our cake topper was one of my favorite details from our wedding. I got ours from PSWeddingsandEvents shop on Etsy! Unfortunately I could not get my husband to agree to have our first dance to A Whole New World, but Disney has so many great love songs and there is a huge selection for your first dance as husband and wife – or your Father/Daughter or Mother/Son dances as well. Disney themed jewelry or bouquet accessories are a great way to incorporate Disney into your big day, and try some Mickey cuff links or fun Disney socks for the groom and his guys. Disney-themed invites are also a great way to spread some Disney magic. Sites like Etsy or Invitations by Dawn are great options and have beautiful invitations! With all the changes coming to Hollywood Studios, let’s take a look back at the iconic park and what it was on opening day in 1989. With each park being a completely different adventure, why not go to all four in one day? There were so many announcements made, between the parks, the movies and the various other aspects that go in to making Disney so magical, that it was difficult to narrow it down to just a few. I mean, I’m excited about pretty much all of them!